Notre Dame is so desperate to pretend they haven't decided to fire Weis, they've blocked their private plane (also known as the SchmoozeJet) from being tracked on the Internet. Though odds are 2:1 it's been to Palo Alto. University officials have pointedly declined to offer any endorsements of Weis, and he himself hasn't acted particularly confident he'll be back: Weis canceled his press conference Sunday, after yet another loss. So it's no wonder Irish fans are eagerly jumping into that other South Bend tradition of speculating on who the next coach is going to be. But the school has taken away one of their favorite tools. 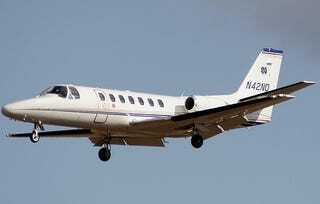 Long have fans used flightaware.com to track the progress of a certain Cessna Citation with the tail number N42ND. But try to look up the school's jet now, and here's what you get. Now officials can fly in and wine and dine the head coach candidates at their leisure, secure in the knowledge that it won't be all over the message boards the next day. And Weis can sleep a little easier, not having his failure tracked in real time. Make no mistake, though; he's still gonna get shitcanned. Notre Damers, quit picking on coach Charlie Weis. There is nothing he can do because it's out of his hands. God has intervened and is repaying Notre Dame for bestowing an honorary degree on pro-abortion President Obama.